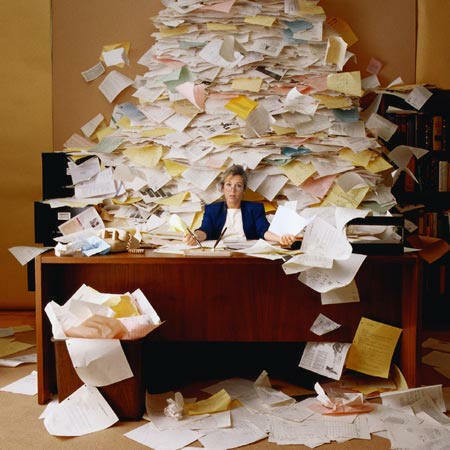 If your desk doesn't look like this, perhaps your Administrative Professional deserves some thanks! Every year, the fourth week of April is designated as Administrative Professionals’ Week and this year April 25th specifically is Administrative Professionals’ Day. So who is it in your business who takes care of all the stuff you don’t have time for? You know, the organizing of files (so your office doesn’t look like this), booking flights, scheduling appointments, handling all the details so nothing falls through the cracks and you get to do what you’re so good at. I guarantee your Admin knows all about this day and if you don’t acknowledge, well, let’s just say you may want to handle your own travel plans next trip, lest you be put on a schedule with 3 connecting flights and tight connection times. Ha Ha! You may be tempted to wait to the last minute and then pick up a box of chocolates. Oh, but wait. I said Administrative Professionals’ Day, not Valentine’s Day! Don’t go there. If your admin considers lunch with the boss a delightful treat. If you really want to send the right message, a message of appreciation and gratitude for what she or he does for you day in and day out, here’s a better Administrative Professionals Day gift idea. Gratitude Cookies from Zen Rabbit. Or maybe Gratitude Cookies and Zen Crunch, together – they do make a nice combo package. Or perhaps a very cool Money Tree? Since taking care of a gift for your Administrative Professional is NOT something you can delegate to your Administrative Professional (please! ), you need to take action NOW while it’s fresh in your mind. April 25th is approaching faster than you think and you do NOT want to be caught short. Check out the gift packages at ZenRabbit.com and get free shipping on orders placed by April 18, 2012. This is Customer Service Week. Now you might think that every week, or every day, is about providing excellent customer service. That’s what I would say too. But this week is actually more about recognizing the people on your team who work with your customers and help ensure that they are properly taken care of. Increase company-wide awareness of the importance of delivering super customer service. Thank colleagues in other departments for their support. Remind customers of your team’s commitment to creating raving fans. Throw a party and provide breakfast, lunch or afternoon treats. Hand out certificates of appreciation. Bring in a massage therapist to provide seated or chair massages. Play games or other fun activities and award prizes. Give away special gifts (Gratitude Cookies or Zen Crunch make an especially nice gesture). It’s not so much about what you choose to do, as much as that you do something to recognize the efforts of your customer service team. Heads up ~ The week of April 18-24th is Administrative Professionals Week and April 21st is Administrative Professionals Day. Started in 1952, as National Secretaries Week / Day, it was organized to call attention to the value and contributions of administrative professionals in the workplace. Over the years, this has become one of the largest workplace observances and is celebrated worldwide during the last full week of April. Now is a good time to remember and appreciate the employees who are working so hard for your company’s success. It’s the time of year when school’s out and any holidays that generate good will and celebration are few and far between. This year, many companies are asking fewer employees to make do with less resources. Which is why it’s the perfect time to show some gratitude for your people. Yes, people need to feel connected. They need to feel part of a community. They need to know that what they are doing day in and day out on behalf of your company is relevant. Giving food gifts, or “breaking bread” with others, has always been an important and personal form of recognition. It offers a level of genuine connection that cannot be achieved through any other means. So make an investment in the well being of your employees (and your company overall) and show some gratitude. Last night after the Giants won Super Bowl XLII, game MVP quarterback Eli Manning was awarded a Cadillac Escalade Hybrid as a gesture of recognition for a job well done. Who are the MVPs on your team and what are you doing to reward their efforts? I’m not saying you need to give away cars to show your thanks. But your business will benefit when you give some kind of recognition to the people who work with and for you.The other day someone was telling me about an article he read that explained how different generations of employees need different levels of recognition. It said that people over 55 think they’re doing a good job as long as they’re not being yelled at. People ages 35-55 like an occasional pat on the back and acknowledgement of their contribution. And workers in their twenties and early thirties need consistent encouragement and to continually be told how well they’re doing. I don’t know how true or valid these “findings” are, but the bottom line is everyone needs to know they are on the right track. So whether it’s verbal praise, a box of cookies or a new car, the important thing is to make sure your team players know how valuable they are to the team’s success.